Chronic shoulder tension. Knots in your upper back. Stiffness, headaches, neck pain. Sounds familiar? Yep- we see chronic shoulder tension a lot in clinic- but allow us to explain why simply treating the shoulder isn’t going to solve the issue. Firstly, muscles don’t work alone. Our body moves and functions through a combination of movements in a coordinated group of muscles, ligaments, fascia, tendons and joints. 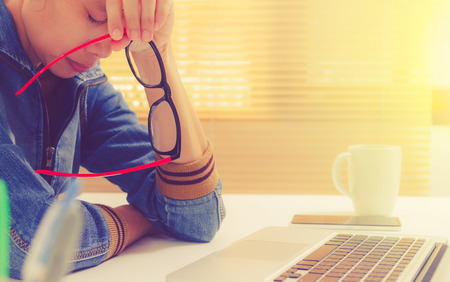 Back pain is our bread-and-butter as chiropractors, and we know from both research and experience that pain in the back doesn’t necessarily mean a problem in the back. That pain could be caused by a problem somewhere completely different- something that often causes a bit of confusion when you come to see us for pain in one area and we end up treating somewhere completely different. Let us paint you a picture. You work in an office. 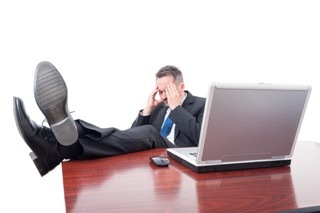 You’re stuck at a desk all day, sitting on your behind, slouched and worn out by 5PM. Your shoulders are tight and sore, and you can feel the knots building up in your upper traps, giving you a thunderous headache by the end of the day. Now, you know those knots and tense muscles are going to cause problems of their own, so you had an upper back massage two days ago and they should be feeling better… but they’re not. So is the problem the upper traps and shoulders, or is it something else? 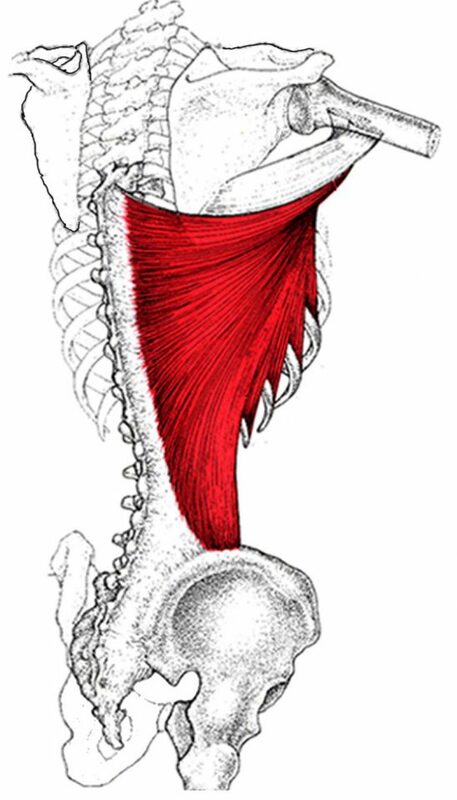 The latissimus dorsi muscle- isn’t it a beauty?! Let’s look at the latissimus dorsi. So, back to you sat at your desk. You’re slouching, your lumbar spine is curved and unsupported, so your latissimus dorsi is stretched beyond the norm and the fibres can’t fire properly. As a result, the muscle can’t complete the role it’s supposed to, the upper trapezius steps in to help and is left to do all the hard work controlling the shoulder itself (Just like that last project your boss asked you and Jane to do together and Jane left it up to you to do all the hard work- thanks Jane….) 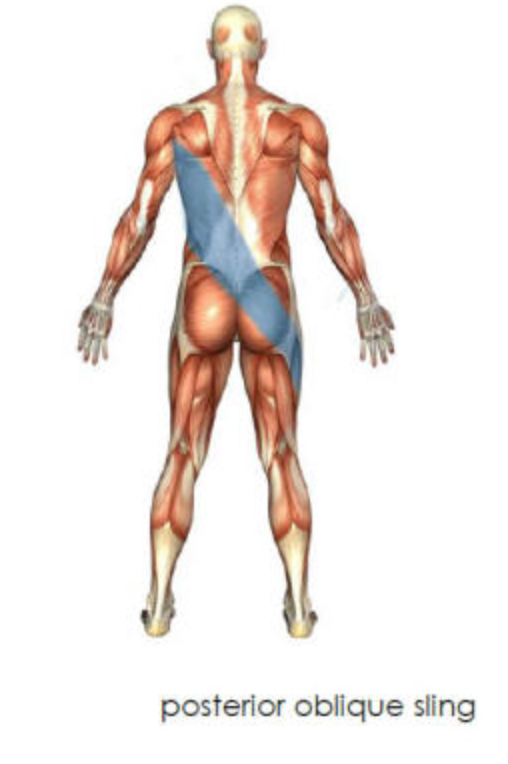 This leads to imbalance and weakness in both the lats and lower traps not to mention a very grumpy upper trapezius. You’ve tried treating the site of the pain (with that amazing back, neck and shoulder massage) and it feels better for a day or two afterwards but then it comes back. It’s fairly obvious by now that the problem with your tight and knotty upper traps isn’t caused by your shoulders- it’s something further afield. So we have to look elsewhere- we look at your lower back and find that your latissimus dorsi is, surprise surprise, not happy with life. Now we’ve found that we also need to look at the Posterior Oblique Sling. * The POS includes the latissimus dorsi, glut med (in the back of the hip) and the thoracolumbar fascia (in the middle of our back.) *NB When we talk about one of the “slings” in the body, we’re talking about a specific group of muscles, fascia and ligaments which all work together to stabilise and mobilise the body. Guess what we find when we examine you? Your lat dorsi isn’t firing properly, which is throwing off the stability in the posterior oblique sling. Your lower back is stiff and restricted, and you can’t laterally flex properly- further compounding the problem with the latissimus dorsi (remember us saying it helps with lateral flexion of the lumbar spine?) So you can see how you’re caught in a vicious circle of dysfunction creating more dysfunction, and, in your case, leading to chronically tight shoulders that just never seem to get better! The above is just an example of a classic case we often see in clinic. Now, there are approximately 640 muscles in the human body, all intricately involved with the others in a chain of movement, that can have a chain of consequences if something in that chain misbehaves. To state the obvious again- each person we see is an individual, and the way dysfunction comes about is different for each person, as is the way in which the body adapts to that dysfunction. As chiropractors, our job is to work out what’s going on and why (and then work with you to get it better) and this often involves looking at areas that might be quite far afield from where the actual pain is felt- but as you can see, there’s a reason for that. P.S. Poor posture affects kids too! So where to begin? How can you improve your posture and reduce pain and problems? We’d suggest starting with some simple exercises, and downloading your copy of “Understanding Pain” which will help you get to grips with chronic pain, what’s going on in your body and how you can take back control! Alternatively, and perhaps best- is to seek professional help and get a diagnosis and treatment plan put in place. You can get started by booking your appointment today.